June 27th-July 1st 2016. Santander, Spain. Laura Baudis, "Noble Liquid DM experiments"
Celine Boehm, "Alternative models to DM"
Alberto Casas, "The 750 GeV Di-photon resonance?" David García Cerdeño, "SUSY DM"
Thomas Hambye, "DM indirect detection from neutrinos"
Juan J. Hernandez Rey, "Dark Matter searches with neutrino telescopes"
Alejandro Ibarra, "Gamma ray constraints on heavy WIMPS"
Igor Irastorza, "Axion experiments overview"
Thomas Jacques, "Validity of EFT in DM searches at the LHC"
Aldo Lanni, "The Canfranc laboratory"
Simona Murgia, "Review of High-Energy astrophysics (Fermi, Galactic center)"
Benoit Famaey, "Issues with LambdaCDM"
Javier Tiffenberg, "Semiconductor based detectors for DM"
Kristian Hanhn, "DM@LHC: Overview of LHC results on DM"
Ning Zhou, "DM@LHC: Simplified models and signal interpretation"
The meeting will take place in the city of Santander, a well known summer resort city in the northern coast of Spain. The meeting starts on the afternoon of June 27th (approx at 3 PM) and will end in the morning of July 1st (approx. at 1:30 PM). Affordable accomodation (67 EUR/night with breakfast and taxes included) has been negotiated for all the participants in the conference hotel. Visit the venue page using the navigation links at the top/bottom of this pape for details on how to reserve your room. Lunch and coffe breaks will be provided to all participants during the duration of the conference and included in the conference fee. Poster: Click the conference poster to download. 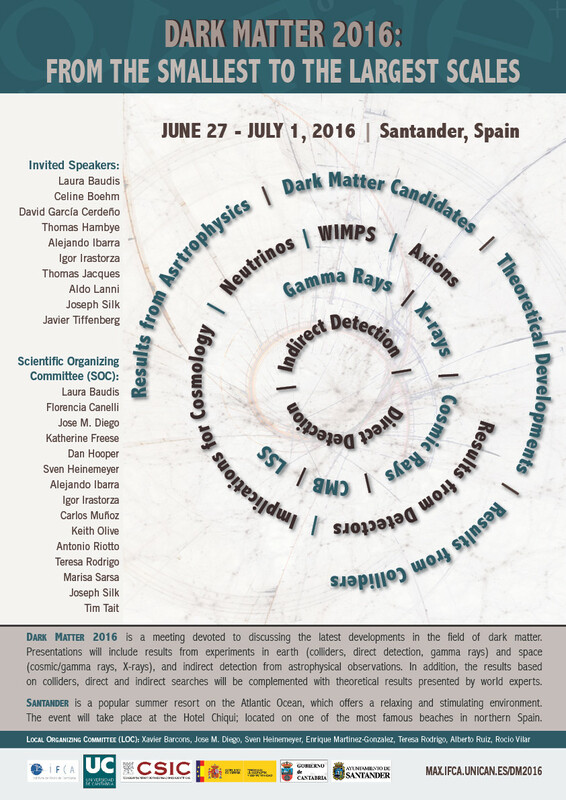 (*) The final list of invited speakers will be announced together with the final program. Some changes are to be expected in this list.